I've really been slacking off lately. We've had a few birthdays plus dance recital coming up so it's been really busy here. Plus my room is still a mess-it is really not fun cleaning that up. So anyway I made this quickie tonight from this sketch. This is such a pretty card! The flower is gorgeous and I love the punched strip of paper! Wow! This is so pretty! I love the colors of the background! I can't believe you cut those flowers out...we all know I cannot cut for beans! Mine would have lost a petal...or 2! Cute card! I love the bp you used and the sewing around the edge! Love the flower you made and that band. I really like how you layered the flowers! It looks really pretty against the border and the patterned paper! i love this card! How pretty the paper is and the flower is just perfect!the border punch is pretty and perfect for this card! Love it! Pretty card. I love the border punch in the middle. It looks great. The dsp is also very pretty. Love the colors. 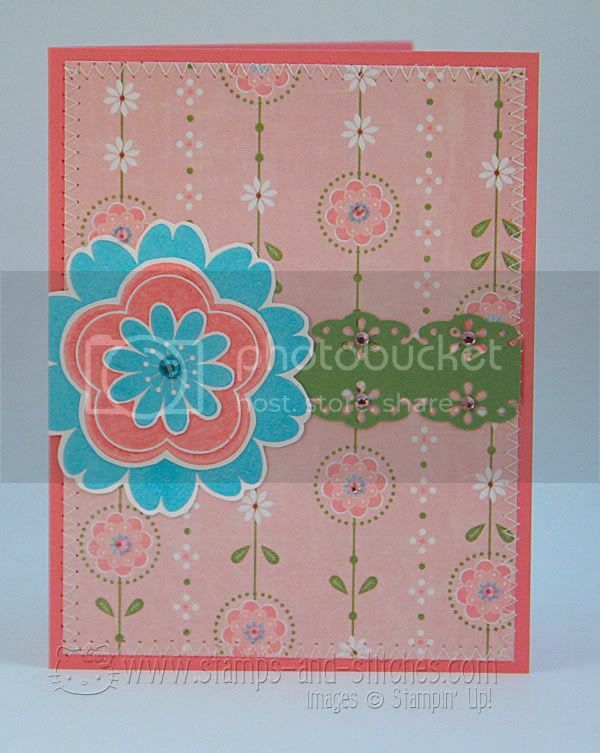 So pretty, love the patterned paper and the Petal Pizazz flower! Oh, I understand the busy! My poor blog is so behind right now. I vow to catch it up over this week, though. I like this card! Sometimes the simple quickies are my fave...totally talking cards here...LOL!